You don’t have to look far to see questions about the health of the institutional church. 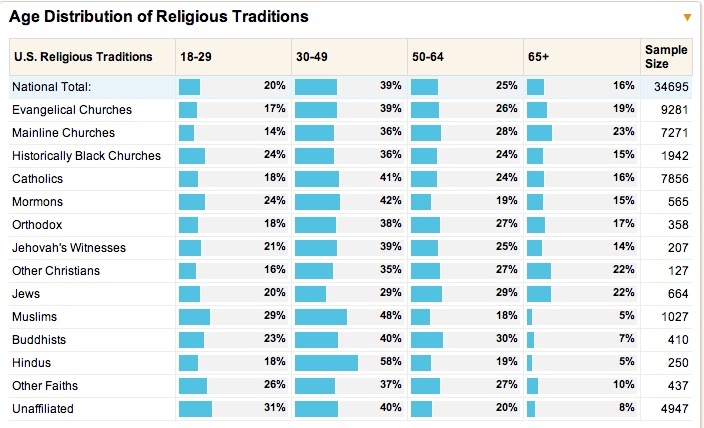 From the growth of the religious “Nones” among the under 30 population to David Kinnaman’s You Lost Me to Rachel Held Evans post on CNN yesterday, the story seems to be that young people have issues with religion, especially in more rigid evangelical churches. The younger generation’s concerns are important because they fill slots in the church created by normal demographic change (that’s sociologist for “people died”). If there are not enough new people in the church willing to commit, what happens to all these churches? I took my first sociology of religion class in 1977. At that time, two recent books were shaping religious discussion. One was Jeffrey Hadden’s The Gathering Storm in the Churches. The other was Dean Kelley’s Why Conservative Churches are Growing. Hadden’s book detailed a study he’d done of mainline churches as they engaged issues of civil rights and social justice. He had found that there were two very different visions of religion between mainline clergy and their laity. The storm that was gathering was a result of conflict over the role of religion. The clergy wanted to push for justice and the laity wanted safe comfortable sermons. The mismatch risked driving people away, presenting survival challenges for mainline churches. The quote above is actually the first two lines of a newpaper story from Spartanburg, SC on Hadden written when the book came out (thanks Google!). The combination of these books painted a disturbing picture of mainline churches. They would prefer a culturally affirming connection to society and simply enjoyed coffee together. Because they didn’t demand a lot, their young people weren’t involved and the church was a bunch of blue-hairs quickly dying off. Meanwhile, evangelicalism was the hot new thing. We had a born-again president. Roe v. Wade formed a rallying point for evangelical churches and Jerry Falwell formed the Moral Majority. The growth of a suburban middle class fueled the rise of family-friendly evangelical congregations. Sociologists set out to explain religious growth and decline (which proved much more complicated than Kelley’s thesis would suggest). The blue line estimate the percentage of Americans who fit Wright’s definition of evangelical. From 20% of the population in 1970, the percentage peaks at about 28% in 1990 and starts back down again. Current data puts the percentage of evangelicals about where it was in 1975. What accounts for the decline? I have three developing hypotheses. I’m hoping some of my religious and sociological readers will push back on these. First, we failed to understand the resilience of the mainline church. While there are some overly culturally-affirming segments of the church, there are many more that are attempting to engage an intelligent, theologically grounded, critique of culture. These are not, as one critic suggested in this piece on the Christian left by Jonathan Merritt, “deader than Henry VIII”. Mainline religion may still be managing the demographic transition of a generation unhappy with Hadden’s pastors. But they are being replaced with a very different kind of young adult. While the numbers of members continue to decline, the strength of the mainline church may be better than ever. We need more careful examination of these trends. My experience with mainline churches finds them populated by people of faith who are mortified that they’ll sound like religious zealots. You have to listen harder to hear their faith perspective, but it may be deeper than you’d first think. Roger Olson had some interesting reflections this week on the mainline (which he’d rather call “old-line”). While I think some of his prescriptions (e.g., worship teams) miss the mark, his call for living spiritual experiences is what I’m seeing within the leading edge of mainline leadership. Here’s the second hypothesis. 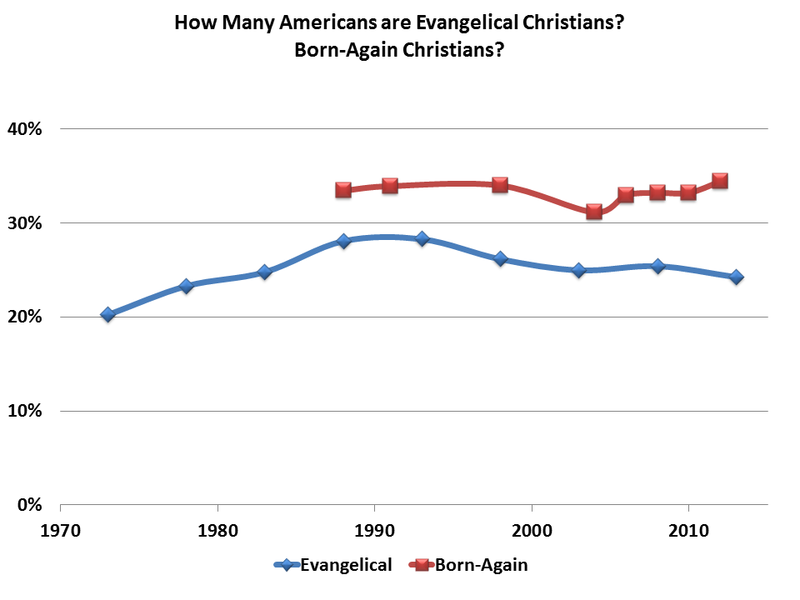 I’m thinking that the rise in evangelical popularity in the 80s and 90s is an aberration and not a trend. It’s not that people are turning away from evangelical faith but that there was a temporary surge in popularity. Some of this is suburbanization and media narrative. Some may be reaction against the stereotypes about mainline religion happening at the time. Sociologists and Religion Writers may make too much of distinctions between evangelicals and mainlines. According to my summary of data from the National Council of Churches Yearbook, there were just under 22.5 million members of evangelical denominations (70% of those are Southern Baptists) and 18.4 million members of mainline denominations. Both groups are showing signs of numerical decline (with some outliers) and are losing ground relative to population growth. The percentage of mainline churches over 65 and under 29 differ slightly from the evangelical churches but neither of those percentages are that far off the total across religious traditions (the contrast with the unaffiliated is striking). This suggests that if evangelical churches find more difficulty in holding on to the young, their demographic issues are serious indeed. The third hypothesis is that Hadden’s analysis of Mainline churches in the late 60s has an analog in Evangelical churches 40 years later. Just as activist voices on the left found separation between mainline pastors and laity, so activist voices on the right may be doing the same in evangelical churches. This is part of Putnam and Campbell’s argument in American Grace and it’s hard to dispute it. This is what prompts so many young evangelical leaders to find alternative ways of engaging “faithful presence”, to use James Hunter’s phrase. As Young Evangelicals are looking for authenticity, they’re being careful about where they look for it. They don’t see a separation between evangelical and mainline churches as impermeable. That’s why posts like this one by Rebecca VanDoodewaard resonate with so many. Hadden’s question about the future of the institutional church is an important one. But no one group has a monopoly on where the answer will be found. More attention to those churches which combine theological grounding with authentic community and service to others will lead us all to better conversations. I echo Paul’s self-description, though I’ve always been in a mainline denomination. A significant number of United Methodists (my tribe) hold beliefs considered evangelical, even if we don’t fit the profile in some ways. What do you mean by “media narrative?” Do you mean news media? I was a journalist at a major metro daily through most of the 70s, all of the 80s and 90s and most of the first decade of the 21st century. First, the daily and most news-weekly press don’t lead, they follow. Second, evangelicals as a rule garner mostly negative or condescending coverage, perhaps with the exception of Billy Graham. If there is a picture the mainstream media paints of evangelicals, the first brush often is painted with some nonsense utterance from Pat Robertson or the late Jerry Falwell or Franklin Graham. Daily news thrives on the fringe, the quotable, with no regard to the Leith Anderson’s of the world who lead the National Association of Evangelicals. I would be suspect of any statistics concerning the rise and fall of evangelicals based on the National Council of Churches. At the least, I would check it against other, less mainline-oriented sourcing. On a recent flight I sat next to a student at the most mainline of mainline theology schools in the city where I live. She confessed she was an evangelical and told me she was jeered at and verbally jibed by her mainline peers for being a person of the book. Most of her classmates, she said, won’t have churches to go to because their denominations are drying up and churches are closing. A final comment: One reason the so-called evangelical church will remain a small portion of American Christianity is that Jesus is a most demanding rabbi. The mainliners can strip him of his divinity and his salvific purpose, they can acculturate Jesus to suit their needs or wants and they can make him their friend, etc. That doesn’t take much work, if any. But being an orthodox, committed apprentice to Jesus is the most challenging but rewarding task a person can undertake. But it is hard, hard work. And who wants to sweat over religion when there are so many options that provide an easier, softer way. I’m writing one response to all three of you because Paul and Steve give testimony that is part of my response to Bill. They make clear that there are many evangelical voices in mainline congregations. I did some congregational research in the early 90s that showed clear groups of moderate and evangelical voices within Methodist congregations. As an evangelical educator, I have known dozens of students who have gone to mainline seminaries and thrived. True, they had to deal with some approaches to biblical scholarship that were unorthodox, but the kind of experience your flightmate reported is rare (as a former academic administrator, I’d argue it’s professionally irresponsible for a faculty member to allow such). The media narrative I as addressing (and unable to unpack in a 1000 word post). is one that doesn’t understand the complexity of religion. Few media outlets had informed religion reporters, so the Falwell/Robertson storyline combined with megachurch pastors and media celebrities became the story. On the other hand, the “mainline is dying” meme was easy to write, even if it didn’t fully represent the church on the corner. I do trust the Yearbook because it provides ongoing data reporting over a long period of time. It’s among the better almanac sources, in spite of the political sensibilities of the NCC. I don’t think anyone in postmodern society is looking for easy religion. Those who want to follow Christ want to do so meaningfully. Those that don’t can simply opt for a now socially acceptable “religious none” definition.